By April of 1918, the United States officially entered the war in Europe and with that came rationing. Sugar, as well as many other commodities, became scarce. The holiday that was starting to see such success was shelved. With the end of the war in 1919, sweetness returned to October. So sweet in fact, Candy Day became an entire week. Then in 1923, the day kicked into the full charitable swing. Sweetest Day’s theme of charity and giving became apparent in 1921 when the Detroit Retail Confectioners, Detroit Wholesale Confections Club, Detroit Jobbing Confectioners Association and the Michigan Confectioners Club joined forces with the Red Cross to distribute thousands of bags of candy to hospitals, orphanages, shelters and homes across Michigan. The celebration also included 100 regulation army target balloons which dropped coupons worth a box of candy. 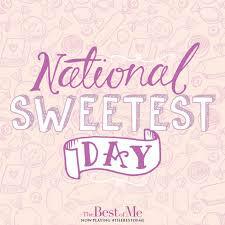 In 1929, Sweetest Day settled into its current home, the third Saturday in October. Now, National Sweetest Day is a day to take care of all those who need care. The theory is that even those who need a lot of care, when given the smallest token of kindness will feel the effects. We have seen that in the many videos where someone brings a meal to a homeless person. A little treat, a card, a show of support during a time of need may be the sweetest gift on this day. Of course, a card would not do much for a homeless, and candy wouldn’t do much for them either, but a piece of candy would put a smile on their face, simply because it would be so unexpected. National Sweetest Day could also be a day for random acts of kindness. A day do something nice for someone else. There is so little of that in the world in this day and age, and maybe what started out as a specific day to do something nice for others, could eventually become a daily random acts of kindness day. 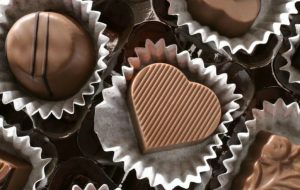 Originally designated to be celebrated the second Saturday of every October, the confectioners’ convention in Detroit in May of 1916 made the final resolution. Walter C. Hughes, the secretary of the National Confectioners’ Association, encouraged Americans to patronizes their local candy shops, bakers, and druggist for the highest quality confections. 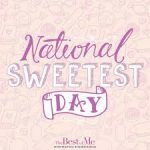 The Sweetest Day…..wait, is it October 22nd or the 14th? Now I have to make my dogs more sweets- RELAX! They’re dog friendly version “chocolates” made with carob and even then they are limited to how much they get! IT’ll be the new National Sweetest Doggy Day I think, LOL! WE’ve come up with a new holiday, haha! !